Most of you know the 2012 California Masonic Symposium was held at the Pasadena Scottish Rite Center on Sunday, June 1, 2012. One of the speakers there was WB Trevor Stewart of the UK (United Kingdom – England, Scotland and Northern Ireland.) WB Stewart is a retired university professor of history and a Past Master of Quatuor Coronati Lodge No. 2076, the premier Lodge of Masonic research in the world. Monday evening, 2 July at the Scottish Rite Center. 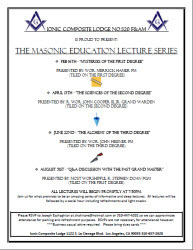 His talk will be open to Masons if all ranks, their families and friends. After dinner, about 7:15 – 7:30 PM, WB Stewart will speak in the Heald Lodge Room. Please let me know if you would like to join for dinner so appropriate arrangements may be made with the caterer and the building. If you would just like to join for the presentation you are welcome to do that as well . . . although it would be nice to know if you plan to do that as well. This is a wonderful opportunity to hear a great speaker. I hope you will be able to take advantage of it.